A project’s TIMELINE shows all the activity on that project (actions taken on User Stories, Tasks or Issues, for example, a Task has been assigned to a member of the project) as well as some information about the project: the name, the logo, the tags, number of likes etc. In addition, you can send an e-mail to all the admins of the project – scroll here to see how. Note: If you are an admin for the current project, you can change the project’s logo, name and other settings. To see how, you can go to The Admin module. 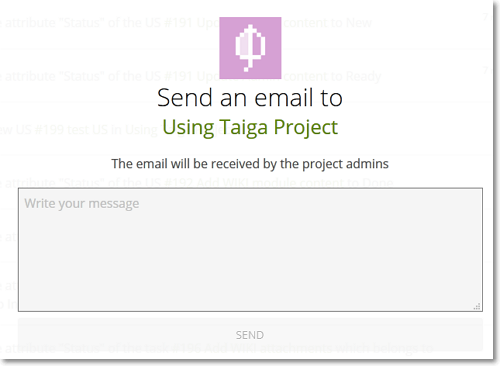 To access the TIMELINE of the current project at any time, on the Taiga Panel, click . To ‘like’ a project, go to that project’s TIMELINE and then, in the top-right side of the page, click Like – the project will now appear as Liked and your like is added to the total count. To send an e-mail to all admins of the project, next to the the Watch or Watching label, click – this action opens a popup where you can enter the message you want to send. To send the message and close the popup, click Send; to close the popup without sending the message, in the top right corner, click X.